Keeping your home clean is a necessity but it can end up eating into your monthly budget quite severely if you’re not careful. In this article we'll look at some products and tips to prevent you wasting money on cleaning your home. Buying different products for every single household job that you need to do will end up taking a chunk out of your household budget. Many of these products are not that much different from each other and are designed to persuade consumers to part with their hard-earned money. 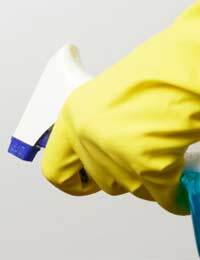 It’s more economical to use cleaning products that are suitable for numerous uses. There are many products that can be used neat for cleaning floors, diluted for washing up and handwashing and in a slightly more concentrated form for washing down wood and glass for example. Do be careful when you’re cleaning delicate materials that the product is suitable though. There are many disposable cleaning items on the market. Although they seem relatively inexpensive, replacing them regularly can add up to a significant amount of money. Disposable goods are also worse for the environment than re-usable items. Use products on reusable cloths and cleaners that are concentrated so that less product is required each time. Cleaning products can be expensive unless you know where to shop. Look for supermarkets’ own brand cleaning products as they will generally cost less money than big branded items and be just as effective. Look out for special offers on cleaning products too and buy in bulk when large savings are to be made. Check out pound shops and other discount retailers as they often sell good quality cleaning products at knock-down prices. It could be that you don’t need to spend any money on cleaning products at all, at least for a while. There are many products that you probably already have in your kitchen that make effective cleaners. Lemon: Lemons cut through grease and also smell really fresh and clean. Add lemon to a dishcloth and it’s as good as washing-up liquid. Lemons are also great for getting rid of smells and cleaning microwaves and fridges. Soda water: Soda water is an excellent stain remover. Pour over fresh spills and dab. It will also improve ground in stains. White vinegar: White vinegar is probably the cheapest all-purpose cleaner you’ll find. Once it dries it won’t smell of vinegar either; the smell evaporates to nothing. White vinegar can be used as a basic cleaner for kitchens and bathrooms etc when it’s diluted half and half with water. This mixture will also neutralise any unpleasant smells in the home. Baking soda: Baking soda costs next to no money and is ideal for unclogging drains. Pour a quarter of a cup of baking soda down the drains weekly and follow with hot water. Olive oil: Mix olive oil and lemon juice to polish wood. Use a quarter of a cup of lemon with half a cup of olive oil. Coca cola: Coca cola cleans loos! Pour leftover Coke down the loo and leave overnight. Stains should be gone in the morning.